I want to keep you updated on the head to toe transformation of Academic Affairs that we believe is and will strengthen and streamline educational programs at MCG. We’ve talked about sweeping changes at the frontline with an Admissions process that is improving our assessment of candidates as it trims things like Admission Committee members and essentially cuts interview days in half. Thank you again Dr. Kelli Braun, a 2004 MCG graduate, for leading this successful transformation. Well this week we announced that Dr. Lee Merchen, an honored, enthusiastic educator who has served on the MCG faculty for about a dozen years, has been named assistant dean for curriculum (clinical) in the Office of Academic Affairs. Dr. Merchen joins the Academic Affairs team as we construct what Senior Associate Dean for Medical Education, Dr. Doug Miller, characterizes as a modernization of our entire curriculum. Goals include enabling students to get earlier exposure to patient care and provide more flexibility, particularly in the fourth year of medical school. This does not mean students will do less but instead can zero in on what has become most important to their futures, whether it’s a particular specialty or to spend more time on research or even to spend more time studying for Step 2 of the U.S. Medical Licensing Exam typically taken in the fourth year. 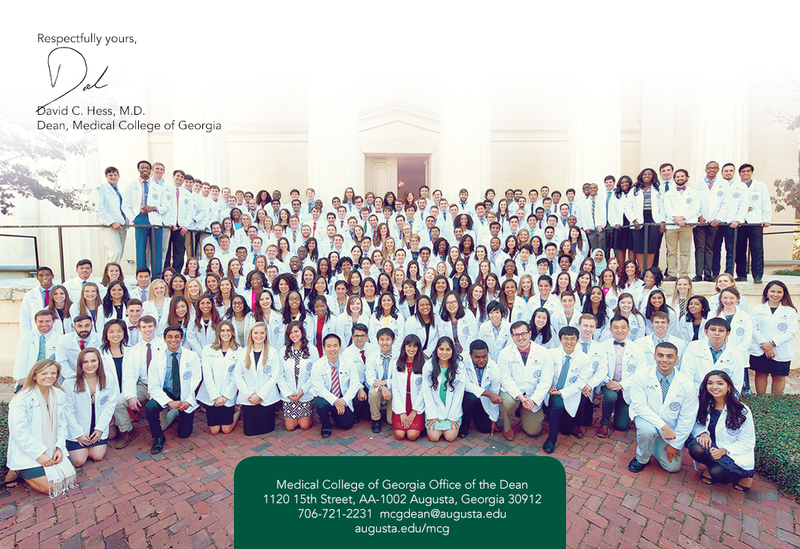 We believe these efforts, which continue to evolve and which Dr. Merchen will help us develop, will strengthen MCG’s already clear strength in medical education (remember Match Day results) and enable us to even better meet the needs of our students and the physician needs of our state. The newest member of the Academic Affairs team is a graduate of Wright State University School of Medicine in Dayton and completed her internal medicine training, including a year as chief resident, at the University of Cincinnati. She joined our faculty in 2007, first served as associate program director, then as program director of our internal medicine residency program. A decade ago, she led the creation of our internal medicine clinician scientist program, a five-year track, which does just as its name implies: prepares internists for a career that focuses on research. She has been honored many times for her teaching of residents and students, so we believe this position is a natural fit for her as we now innovate and improve our entire curriculum to better suit the needs of our students and our state. To help with this transformation, we thank our state legislators and regents and Governor Brian Kemp for including $500,000 in the upcoming fiscal year to continue to also develop a program that will help us produce specifically more primary care physicians for Georgia. You can tell that this effort is a definite work in fast progress because we have already moved away from calling it “3 + 3” (meaning time in medical school plus residency) to “the MCG 3 + track” since we are now planning to also initially incorporate OB-GYN – four years – and general surgery – five years – into this primary care emphasis that also includes family medicine, pediatrics and internal medicine. We plan to put our final proposal before the Liaison Committee on Medical Education late this summer. See this article from the AAMC for a more global perspective on this. Here’s some more great medical education news for our state. This session the legislature also approved House Bill 287, which deleted the existing Preceptor Tax Incentive Program Tax deduction but replaced it with a new and expanded actual tax credit. As you all know, we simply could not educate physicians and give them the full scope of practice experience they receive – from a complex care, academic model to a “I am the only doctor in town” model – they get here without our volunteer faculty. House Bill 287, spearheaded by Denise Kornegay, associate dean for Area Health Education Center and executive director of the statewide AHEC network, helps provide a concrete example of what these volunteer educators provide to us and to the future of their profession. Denise got the tax deduction started for physicians teaching Georgia medical students five years ago and now has helped make this new tax credit available to community-based advanced practice registered nurses and physician assistants as well. The bottom line is physicians get a $500 credit for each of the first three rotations they teach and $1,000 for rotations 4-10. So a doctor who teaches 10 rotations would earn $8,500 in tax credits for that year, which directly reduces the amount of taxes they owe. Great work for an essential cause, Denise. Nobody knows the health care needs of Georgia any better. You know I love history and that MCG is a treasure trove of history that includes leaders like Dr. G. Lombard Kelly. He was a native Augustan, a newspaper reporter who actually ended up writing, not just journal articles, but children’s books as well as books on marital relations and related health problems. He graduated from MCG in 1924, worked for a year as a research assistant at Cornell University with Dr. George N. Papanicolau who developed the Pap smear, and came back to MCG as an associate professor of anatomy in 1927. He rocketed from there, becoming chair, acting dean, then dean. He helped the school regain accreditation in the 1930s, so instead of being shut down, MCG began to grow in size and quality. Third Kelly Lectureship set for April 25, 12:30 p.m.
Dr. Kelly would eventually lead our teaching hospital as well, which was University Hospital at that time. That was before we opened our own hospital in 1956. In fact, Dr. Kelly developed the plan for MCG to have its own hospital. He also helped us become an independent entity in the University System of Georgia, at which time he went from being dean to being our first president. I say all that to also say that the Department of Cellular Biology and Anatomy honors him April 25 at 12:30 p.m., in the Harrison Commons with the Dr. G. Lombard Kelly Lectureship. This year’s renowned speaker is Nobel Prize recipient Dr. Bruce A. Beutler, director of the Center for the Genetics of Host Defense and Raymond and Ellen Willie Distinguished Chair in Cancer Research at the University of Texas Southwestern Medical Center in Dallas. Dr. Beutler and Dr. Jules A. Hoffman shared a Nobel Prize in 2011 for their findings about the activation of our frontline innate immunity. It’s also worth noting here that the late Dr. Ralph M. Steinman also was awarded a Nobel Prize in Physiology and Medicine that year for his findings about the role of dendritic cells in innate immunity. Dr. Beutler will discuss “Discovery of Gene Function Using Random Germline Mutagenesis in Mice” when he visits us. This is the third Kelly Lectureship, and it is driven by graduate students who learn alongside faculty in our Department of Cellular Biology and Anatomy. This year’s effort was led by Jessica Pierce, who studies with biomedical engineer Dr. Meghan McGee Lawrence. Check out more on Dr. Kelly. Finally today, we note the passing of the great physician, innovator and educator Dr. Joseph R. Smith, professor emeritus. Dr. Smith was a unique, gifted and passionate individual who came to MCG in 1985 as a fellow in physiological neurosurgery before joining the faculty. He studied with another great, the late Dr. Herman Flanigin, and Dr. Smith would become director of the epilepsy surgery program when Dr. Flanigin retired. He would help bring innovative brain treatments to patients, like early studies of a neurostimulator that works like a pacemaker in the heart to detect oncoming seizures and deliver a brief electrical stimulus to block it. And the palliadotomy, in which a tiny portion of the brain is destroyed to alleviate the uncontrolled movement of Parkinson’s with movement disorders. Dr. Smith’s dynamic presence was missed the day he retired in 2007 and still is. We send our thoughts and support to his family. April 18 – Dr. Doug Miller, senior associate dean for medical education, will be master of ceremonies for, and MCG’s SeroTONEins will perform during the AU Arts Council season finale of Noon Arts at the Lee Auditorium. Check out more here.